Following a series win over Alabama and two midweek annihilations of Arkansas-Pine Bluff, Ole Miss baseball has hit the road and will take on the Missouri Tigers this weekend on the diamond. The Rebel bats have come alive in their three most recent contests as head coach Mike Bianco has shuffled the batting order to give his lineup life after it fell stagnant in recent weeks. Ole Miss baseball will travel to Missouri for File photo by Christian Johnson. In its three games since Sunday, Ole Miss has racked up 38 hits, outscoring opponents by a combined 49-4. The shift in the lineup card for Ole Miss has coincided with a breakout from shortstop Grae Kessinger at the plate. Kessinger, who had been batting leadoff for Bianco, has found himself in the No. 2 hole in the batting order in recent games and has gone 7-11 at the plate since Sunday, good enough to raise his season batting average to .275. 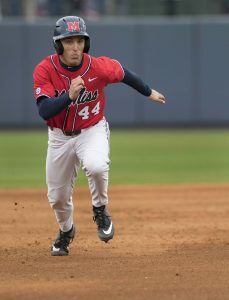 If Kessinger can join the likes of relatively consistent Rebel hitters like Ryan Olenek and Thomas Dillard, he could be a big piece in ensuring this offense stays on track. The Rebels are traveling to Columbia with a slightly altered starting pitching rotation as well. With Zack Phillips, who had been the Rebels’ Saturday starter, pitching Wednesday’s game against Pine Bluff, Mike Bianco has moved left-hander Doug Nikhazy to the Saturday role wedged between Will Ethridge and Gunnar Hoglund. Save for a couple of bad innings against nationally-ranked East Carolina and Louisville, Nikhazy has been effective both in starting and relief roles for the Rebels this season, posting a 4.15 ERA and striking out 20 batters to this point. Nikhazy could bring a share of consistency to Saturdays for Ole Miss as Phillips had struggled to find a rhythm thus far on the weekends. The other two weekend starting arms for Ole Miss, Ethridge and Hoglund, have also found rhythms of late. Ethridge has been a constant for the Rebel rotation since the beginning of the season, and after some early-year struggles, Hoglund is appearing to turn a corner. In last Sunday’s game against Alabama, Hoglund pitched five innings of one-run ball that helped bring his ERA down to 3.26 on the year. After being drafted in the first round by the Pittsburgh Pirates last summer, Hoglund was expected to be an important part of the Rebels’ pitching staff and may be finally realizing that potential as SEC play wears on. Missouri comes limping into its weekend series with the Rebels after being swept by Arkansas last weekend in Fayetteville. Although the Tigers lost these three games by a combined four runs, being swept still marks a less-than-ideal beginning to conference play for a team already banned from a postseason appearance due to NCAA sanctions. Unlike the Rebels, Missouri has a weekend rotation built entirely of left-handers in Jacob Cantleberry, TJ Sikkema and Tyler Laplante. Ole Miss’s lineup will be put to the test against these three arms as the Rebels have noticeably struggled against left-handed pitching these season, and none of these pitchers have an ERA above 3.00. The Tigers also have multiple men batting over .300 on the year including Mark Vierling who has played in every game thus far. Tonight’s first pitch is scheduled for 6 p.m., and Saturday’s and Sunday’s games will start at 7 p.m. and 2 p.m., respectively.